The new versions of the Mini are a lot of fun to cruise, but after being on the market for about 15 years several common issues have surfaced surrounding these vehicles, especially model years 2002-2008. It is important to be aware of these problems so you can have your car serviced before any of these complications leave you stranded. These five common Mini Cooper issues are also good to know if you're considering purchasing a used one. If you often drive your manual transmission Mini in stop and go traffic there is a fair chance the clutch will fail prematurely, requiring a clutch replacement. Mini Cooper timing chains are noted for becoming loose relatively early in their roadlife. The most common sign of a loose timing chain is a rattling noise under the hood, especially when first starting the car. Ignoring this issue can lead to massive engine damage, requiring expensive repair. The CVT transmissions of pre 2008 Mini Coopers are known to fail with less than 100,000 miles, but this isn't really a driver error. The manufacturer had said this transmission does not require transmission service such as fluid flushes, a statement proven to be false. Transmission maintenance should be done every 30,000 to 40,000 miles in these cars. 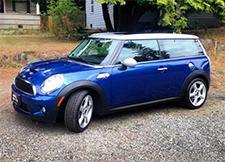 One of the biggest issues with Mini Coopers is the failure of the power steering pump. If your Mini suddenly becomes difficult to turn, especially at lower speeds, this is a fair sign the pump has failed. To repair the pump the front of the car will need to be dismantled, meaning it may be worth testing the cooling fan and other hard to reach parts in this area while in the shop. If your Mini has more than 50,000 miles on the clock be on the lookout for leaks from the thermostat housing or the water pump. It may be wise to replace the pump prior to a leak occurring, as this could save you hundreds of dollars in labor costs. Nearly all vehicles will have some sort of common issues that become known after they've been on the road for several years. If you need Mini Cooper repair in Asheville head to The Organic Mechanic. Our team is highly skilled at European auto repair! To request professional European auto repair in Asheville for your Mini, BMW, Mercedes or other make, give us a call at (828) 232-8120 today.